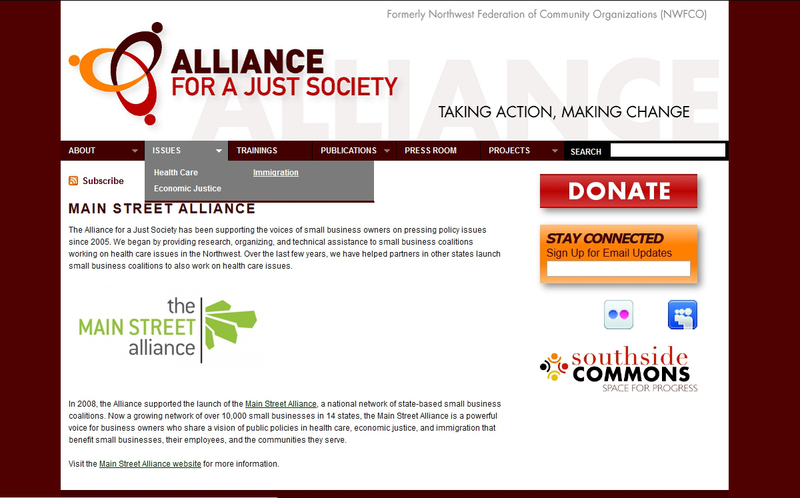 Alliance for a Just Society | Building Websites for the People! 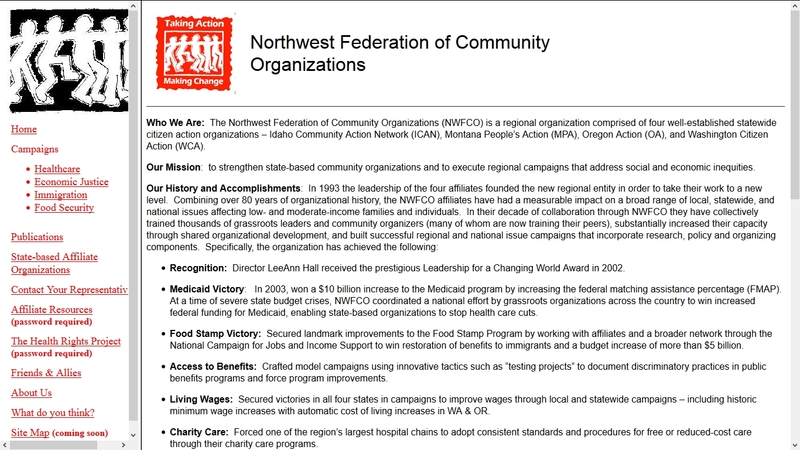 I stumbled into community organizing in 2003 by answering a job posting for a position as an Office Manager at Northwest Federation of Community Organizations. 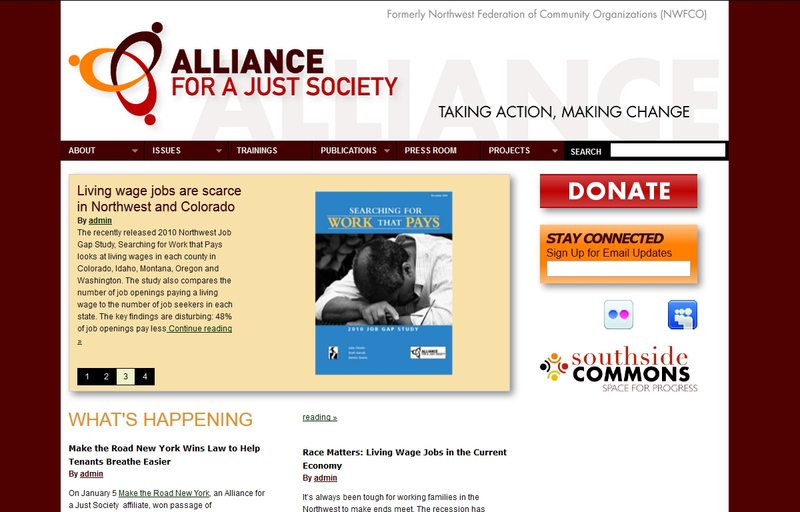 The organization has since expanded and changed its name to Alliance for a Just Society, but the focus remains on working with grassroots organizations around social, racial, and economical justice issues. During my time there, I was given the opportunity to learn and do a wide variety of things. 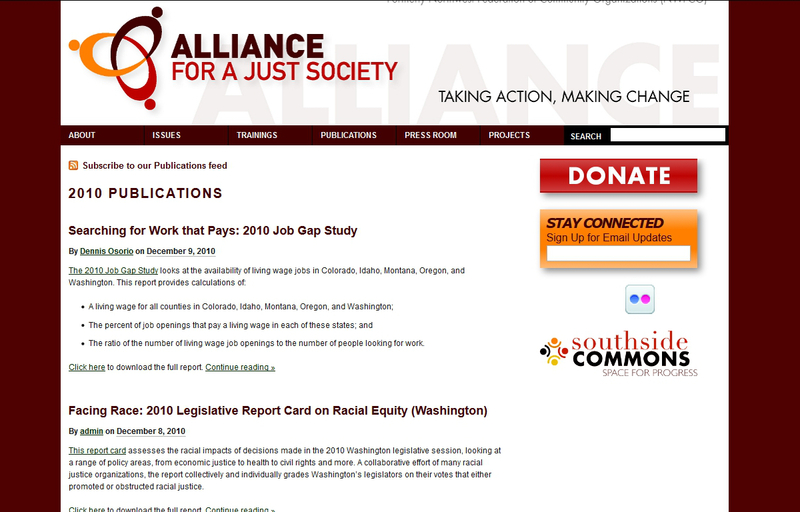 Below is a quick review of Alliance for a Just Society’s website over the years. Not coincidentally, it also parallels much of my development as a web designer. The timeline begins with the latest year on top. 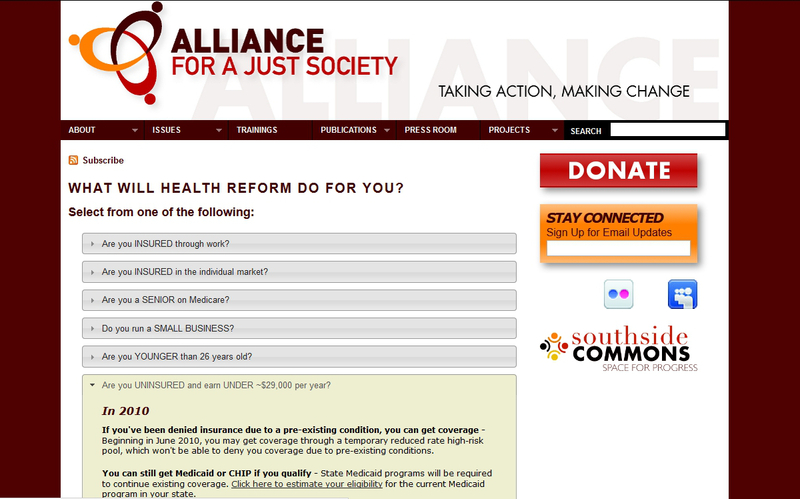 The organization changed its name to Alliance for a Just Society and I completely reconstructed its website. I used tutorials found on ThemeShaper to create a custom theme for use with WordPress. Moving to WordPress allowed me to reach a goal that I had long been dreaming about – the ability to create sophisticated websites that I could hand over to someone else to run. No longer did adding or editing content have to go through me. Instead, writers were empowered to do it themselves, even if they did not have much technical knowledge. I re-made Alliance for a Just Society’s website – this time to be used with WordPress, allowing non-technical users to add their own content. I used jQuery Cycle Plugin for the slider of featured posts on the home page. 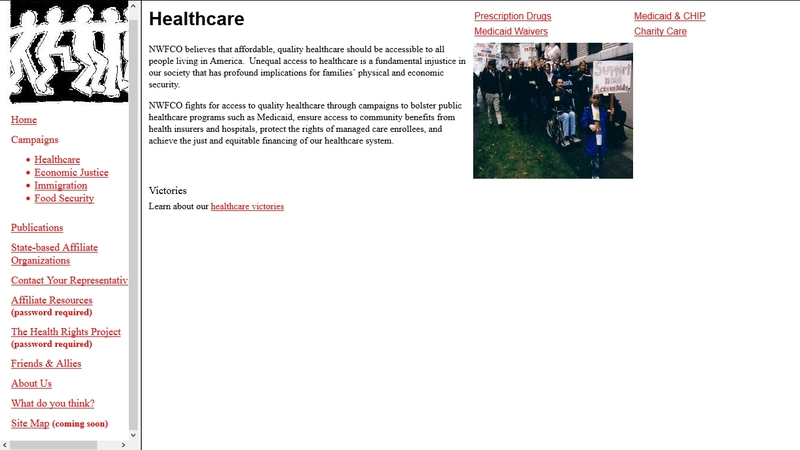 I used jQuery UI to create the accordion effect on this FAQ which explained the new provisions and protections under Health Care Reform aka Obamacare. 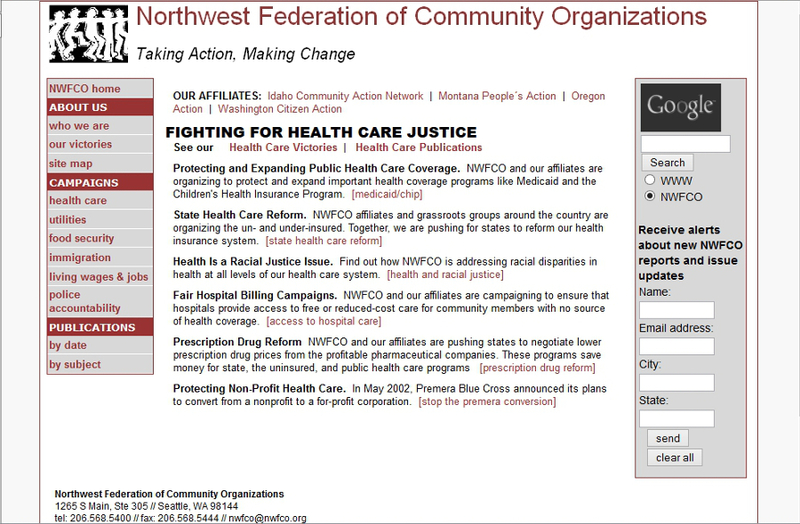 For almost ten years, Alliance for a Just Society’s website featured my hand-crafted code. I learned a ton during this time. 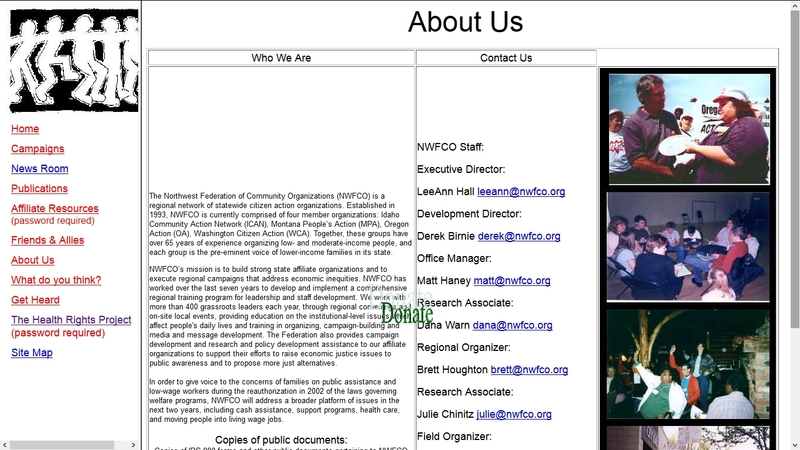 To illustrate the evolution of this site, as well my own development as a creator of websites, I have included screenshots from 2006, 2005, 2004, and 2003. 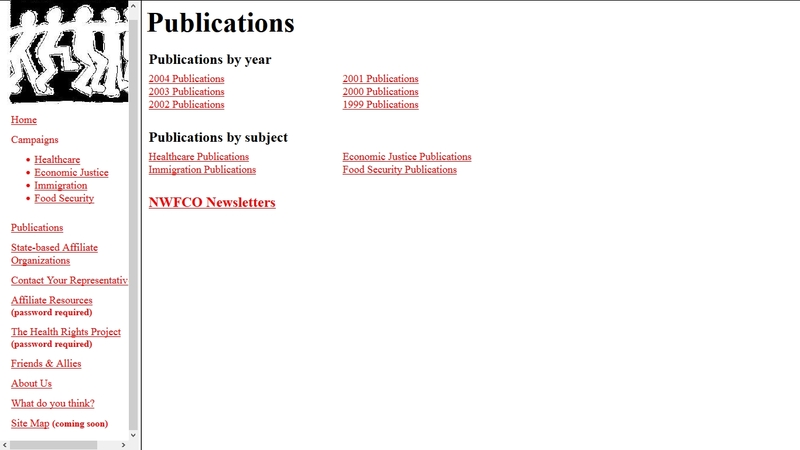 I used Superfish jQuery Menu Plugin for the drop-down menu. While I left the organization to pursue freelance website-making and research products in 2011, the website I built just-simply-worked with very little maintenance and a great deal of use until the second half of 2014, when it was remodeled. I learned about and quickly began using XHTML and CSS for increased efficiency and ease of maintenance. 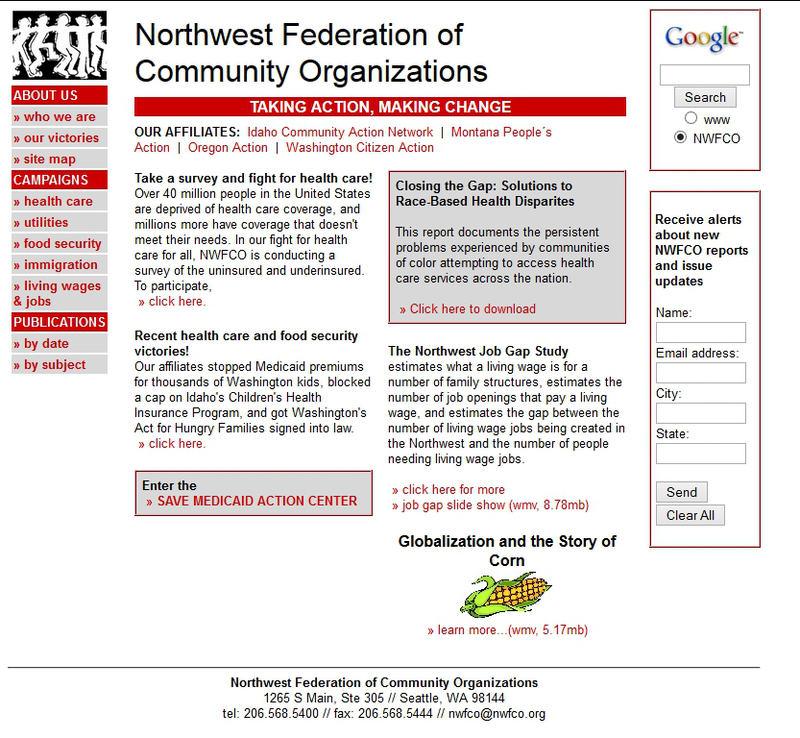 I remade the entire website using handcrafted HTML written in Notepad – Microsoft FrontPage was finally a thing of the past. And, while I continued to use tables for presentation, the iframe was finally gone. Is she not adorable? Behold, the second website I ever created. 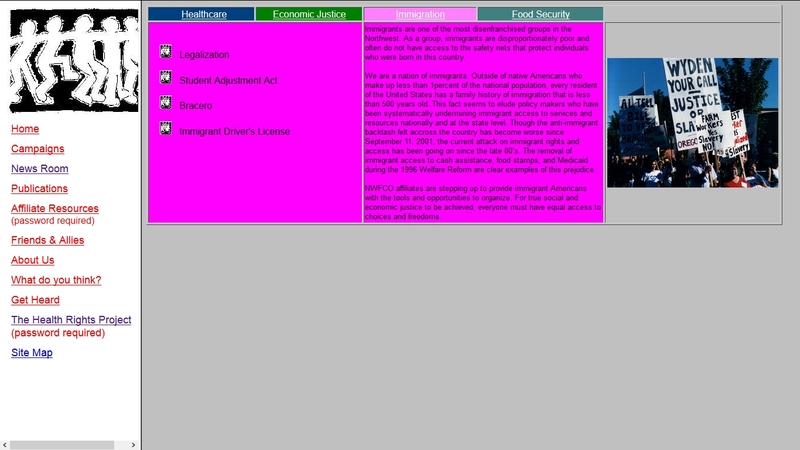 While learning HTML, I continued to update the website using Microsoft FrontPage and began to address some of the worst design and usability problems. 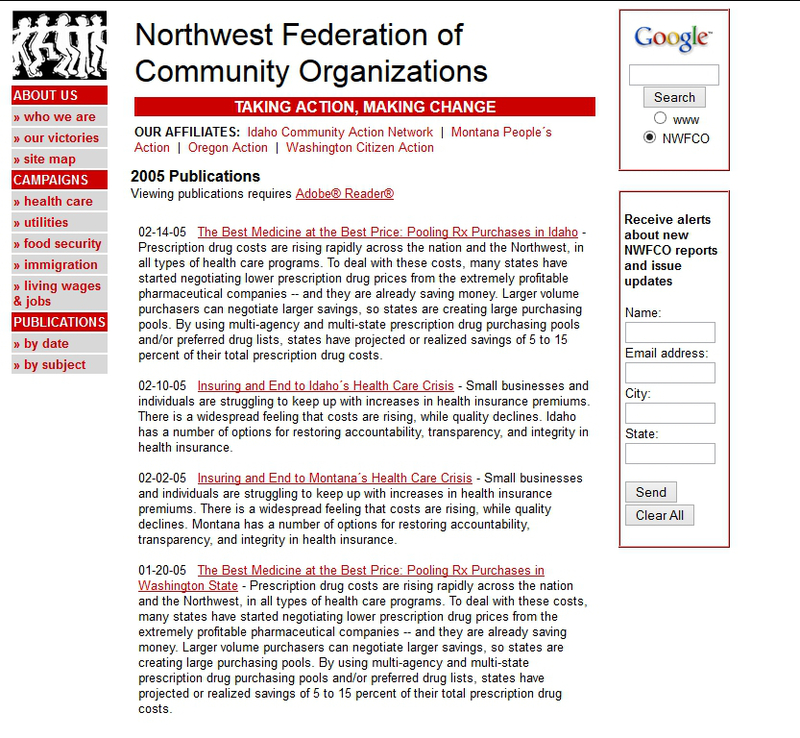 While the website still featured the hated iframe, I had reworked the site so that it at least contained consistent fonts and a single background color to facilitate users’ need to find and read information. 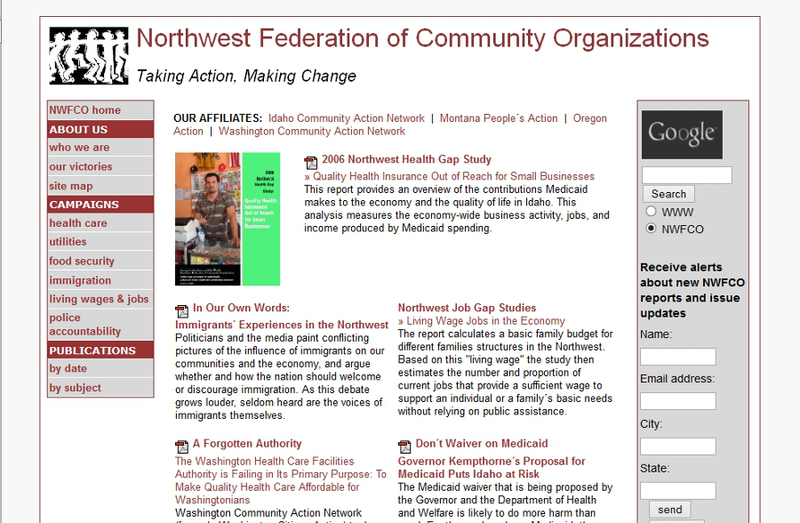 I was introduced to Microsoft FrontPage to update the organization’s website – this inspired me to learn HTML using w3schools.com and Notepad. 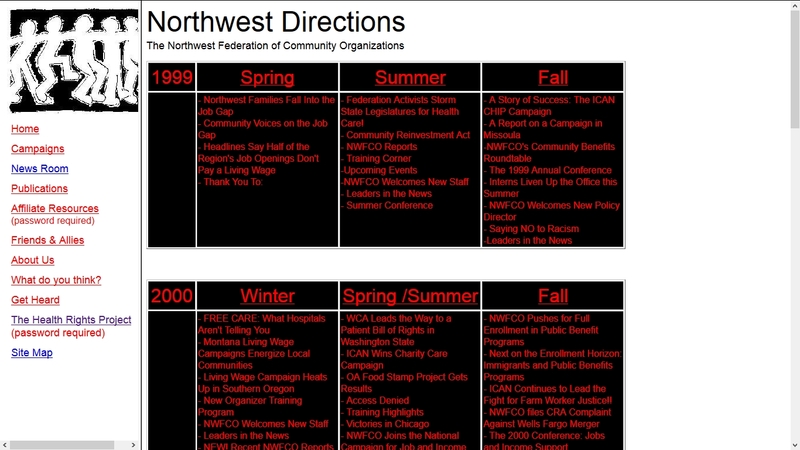 Here are some snapshots of what Northwest Federation of Community Organizations’s website looked like shortly after I started my new job. 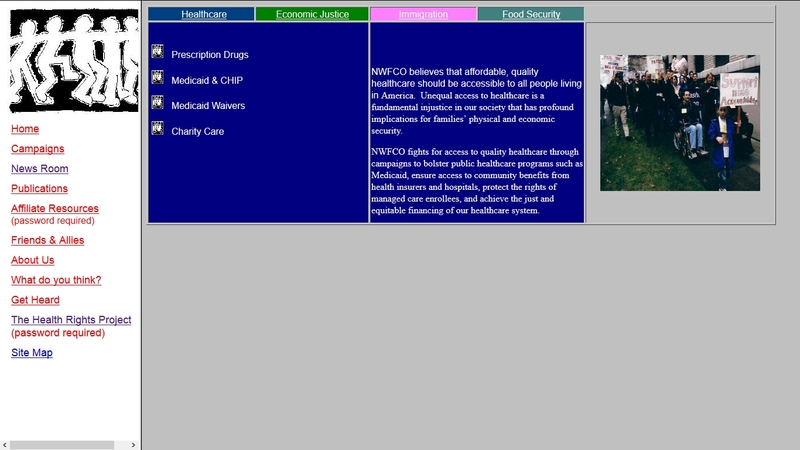 Trying to update this website using Microsoft FrontPage in 2003 inspired me to learn HTML. It quickly became apparent that some bad web design practices needed to be fixed, including the use of iframes and tables for presentation. One of the bad practices that needed fixing was the use of light-colored text over dark backgrounds. 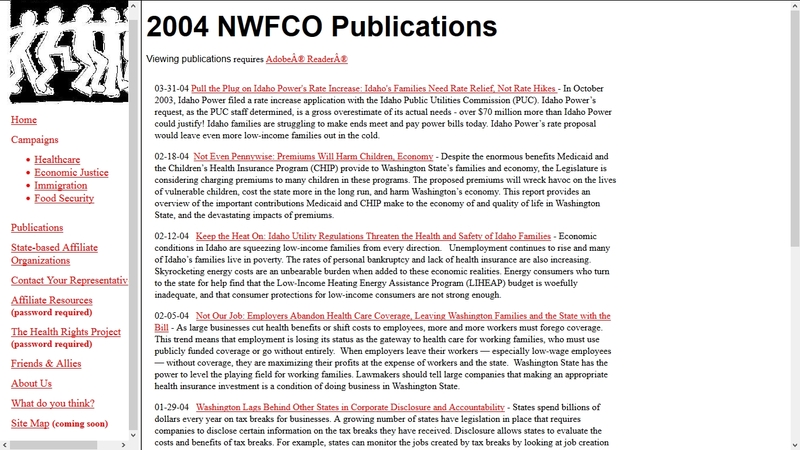 Each issue area, such as health care or living wages, had its own (poorly-chosen) background color. This amount of red text over the black background did not make for a pleasant reading experience.